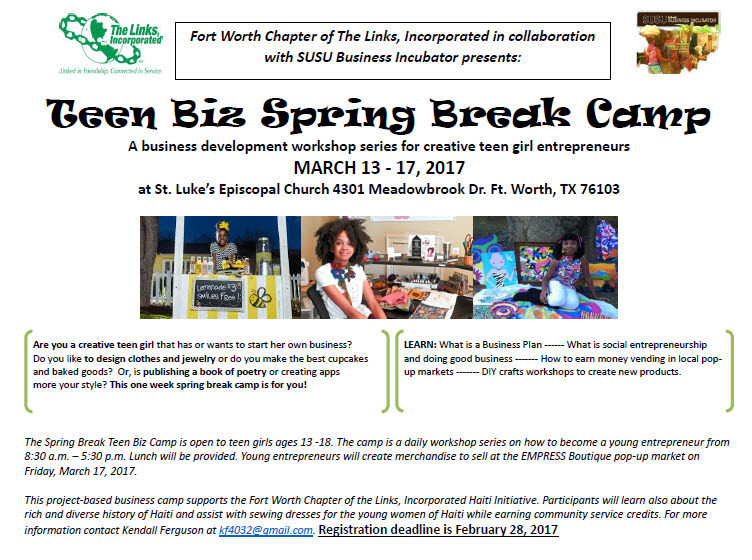 The Spring Break Teen Biz Camp is open to teen girls ages 13 -18. The camp is a daily workshop series on how to become a young entrepreneur from 8:30 a.m. – 5:30 p.m. Lunch will be provided. Young entrepreneurs will create merchandise to sell at the EMPRESS Boutique pop-up market on Friday, March 17, 2017. This project-based business camp supports the Fort Worth Chapter of the Links, Incorporated Haiti Initiative. Participants will learn also about the rich and diverse history of Haiti and assist with sewing dresses for the young women of Haiti while earning community service credits. For more information contact Kendall Ferguson at kf4032@gmail.com. Registration deadline is February 28, 2017. Please complete application attached below and return by deadline.